Have a great week and make sure to let me know what you are reading right now in the comments! Jackson Brodie is a private detective attempting to juggle several cases. At the beginning of the novel, the reader is presented with three stories. In the first, a young girl goes missing after she and her sister camp out in the backyard in a tent. In the next, a young woman is murdered while interning in her father’s office. In the third, a young woman goes to prison for murdering her husband with an axe in view of their baby girl. As Jackson becomes makes progress in the cases, he discovers that they are more connected than he could have ever imagined. This novel is a mystery, but more importantly it is a story about the people who are left behind after tragedy. While Jackson does investigate the crimes, he also provides compassion and understanding for the survivors. He empathizes with his clients because he too has experienced loss when his older sister was brutally raped and murdered. His kindness and his attempt to be a good father are his strong points, but our hero is very much flawed. He can’t stop fantasizing about the women he encounters and he is terrified that his ex-wife and the new man in her life will take his daughter away from him. He thinks that "she wouldn't be the same Marlee in twelve months' time: she would have different skin and different hair, she would have outgrown the shoes and the clothes she was wearing, she would have new buzzwords (New Zealand words), and she might not like Harry Potter anymore. But she would still be Marlee. She just wouldn't be the same." The thing I found most fascinating about this novel is the way that so many of the characters sit on the edge of likeability. I found myself often thinking that I didn’t really like many of the characters. In spite of this, I had a very serious need to find out what happened to them and how they were connected. These are very deeply injured people whose lives have been destroyed. The wreckage is not pretty, but Ms. Atkinson portrays it with compassion and sometimes humor. This is a really interesting novel. I went back and forth trying to decide if I liked it or not. At times, I was not particularly enthusiastic about continuing. I think that’s because there is little imminent danger. These cases are cold and their resolution will likely not change anything in the present. I’m glad I stuck with it, though. The mysteries are wrapped up by the end, some more predictably than others. The characters will make you uncomfortable, make you wince, and make you think about putting this book down, but ultimately this is a good book. I will warn that it takes some time to get used to the peculiarities of the novel, the style, and the characters. This is the first Jackson Brodie novel, and the first book I have read by this author. I somehow already own the third book, so I will be searching out the second. Atkinson is a good writer, with interesting style and quirks. While Case Histories takes some time to get comfortable with, it’s worth the read. Have an amazing weekend, friends. I'll be back on Monday. See you then! I'm finished, I'm finished! Yes, I might be doing a small dance. It has taken me almost a month to read this ginormous tome, but I'm glad I did. Reading David Copperfield has convinced me of the genius of its author. This novel is, as the title suggests, about the life of one David Copperfield. We begin at his birth and follow him through his childhood as his widowed mother remarries a terrible man who controls the family with an iron fist. We follow David as he goes to school, makes new friends, chooses a profession and falls in love. This sounds like a simplistic plot, but it is greatly enriched by the crazy cast of characters that inhabit the pages. The protagonist is sweet, naïve, and downtrodden, but never cloying. He is a great protagonist and it’s a pleasure to follow him as he grows from a child to adulthood. Mr. Dickens has surrounded David with some of the most delightful characters and despicable villains that you’ve ever had the pleasure of meeting. David’s stepfather is truly menacing and Uriah Heep is a sniveling creep. My absolute favorite character is David’s eccentric aunt Betsy Trotwood. Her constant comparison of David to the sister he should have been is hilarious and delightful. This book is supposed to be rather autobiographical and I think it shows. You can tell that Dickens really loves (or hates) these characters. The only part that drove me (and many other readers) crazy is David's love for a young woman named Dora. Dora is ridiculously childlike and although their relationship progresses, it is always an uneven relationship. Far from being a mistake, I think this is Dicken's examination of the difference between the naivete of first love and the endurance of true love. It’s important to keep in mind the original format of a book when reading it. David Copperfield was serialized, meaning that people could buy installments of the novel monthly. I can imagine families gathering around to hear what happened to David next. While this book seems incredibly long at first glance, it works. This is an epic story, but it is one to be read at your own pace. I would not suggest that you get it out from the library, and then put off starting it for a week or two…not that I know anything about that. If you have the time to read it slowly without pressure, I would highly recommend you pick up David Copperfield. Dickens writes amazing characters and if you haven't experienced one of his novels yet, there is no better time than his 200th birthday! Lucy Honeychurch is visiting Italy with her cousin when she is witness to a murder. This unusual set of circumstances brings her closer to another visitor, George Emerson. Although they connect, he is not an appropriate sort of boy and Lucy endeavors to forget the whole experience. Once back in England, she becomes engaged to Cecil Vyse, “an ideal bachelor.” But George and his father soon move into Lucy’s neighborhood and she must choose between what she has been taught and her true desires. Forster is an empathetic and meticulous writer. My poor little paperback was stuffed full of bookmarks, indicating passages I wanted to write down later. Despite this being my first reading, this book manages to feel like hearing an old family story – sweet and familiar. The characters are varied and often very humorous. Forster deftly uses them to make his point about society, but never at their expense. Each person you encounter in these pages, including the bombastic mother, the meddling clergymen and the spinster aunt, are wonderfully and terribly human. This is a beautiful book – half gentle love story, half examination of women on the verge of independence and equality. The reader is immediately aware that Cecil cannot be the right mate for Lucy. She always imagines him in a drawing room with no window, while George loves to roam outside and actually gives up his room for her in Italy so that she can have a view. In Lucy’s love story, an equal opinion in the relationship, or a view, is the necessary foundation for a lasting relationship. If, like me, you haven’t experienced Forster before, get to it! You will laugh at and cheer for Lucy, George, Cecil, and their companions and marvel at the author’s beautiful and precise prose. This short and sweet novel will reignite your confidence in loving classical literature. We all have one. Some of us are a little ashamed and we don't really want to talk about it. Some of us are just determined to do something about it. It's the to-be-read shelf or pile...or shelves and piles. You know how it goes - you win some books and don't read them right away. Your mother/brother/husband/best friend gives you a book and you decide to save it for the right day. You love that magical library place and can't leave without a pile so high it blocks your view. 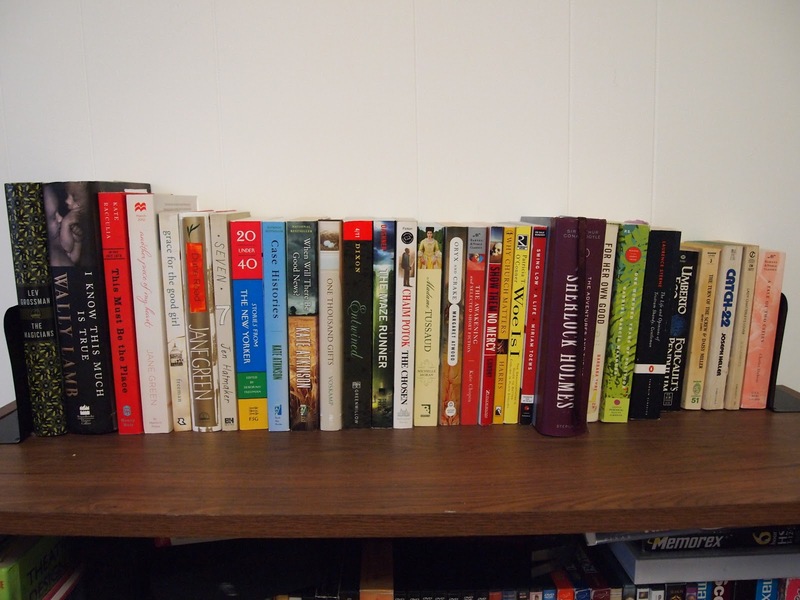 The tbr shelf just sort of happens. So I'm coming clean, kids. 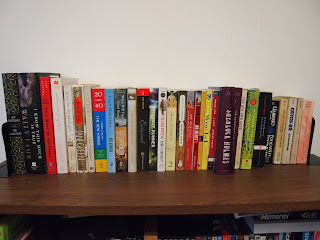 Here is my tbr shelf as of today. So now that I have confessed my bookish indiscretions, it's your turn. Tell me about the unread books in your lives. How many are there? Where do you hide them? It's ok boys and girls, this is a safe place for your literary secrets. The Story: A little boy receives a rabbit for Christmas. The rabbit waits in the nursery for the boy to notice him, to love him, to make him real. The boy comes to love him and the two are inseparable until the boy gets scarlet fever. After he recovers, all of his toys and books are sent away. The velveteen rabbit is despondent until a fairy appears to him and turns him into a real bunny. Mama opines: You guys, I am a little teary. I practically pulled teeth to get David to listen to this book a few days ago. Ever since, he has picked it to read every single day. This is the actual book that my mom and dad gave me when I was around his age. I love this story. It's sweet and simple and if you have never read it to your little one, you must do so immediately! Small note: I will admit to leaving out that tiny detail about them taking all of the toys out to be burned...since it doesn't actually happen, I find that saying that the toys had to be taken away is much better for both of our hearts. Thoughts from David: I like it because the rabbit gets to be real. Favorite part: When the boy has the ill (so cute!) and the bunny goes out to the garden and gets to be real! If I loved you, I would tell you this is the debut collection of short stories by Robin Black. She tells a wide range of stories – a father taking his teenage daughter to get her first seeing eye dog, an artist trying to render a man on canvas who is suffering from dementia, a group of children play acting the wives of King Henry, and a woman traveling through Italy with her brother after her painful divorce. Black portrays each protagonist well, regardless of age or gender. Her middle-aged father is as convincing as the young girl who believes that magic will keep her fracturing family together. The strongest of the bunch is the title story. Black uses an inventive format to tell the story of a woman who is terminally ill. She begins each segment with “if I loved you, I would tell you this.” Her neighbor (who she refers to as ‘yeti’) is oblivious to the effect his actions have on her life. She imagines how she would tell him about the way his selfish choices impacted her life, if she knew him well enough to begin the conversation. The heartbreak of this woman who will leave behind a grieving husband and a mentally ill son is beautifully rendered. Ms. Black has a gift for the heart of the short story - finding the nuanced moments that reveal everything about a person or situation. She places each character on the page with compassion and care because each one of them is broken. Her stories are good and it’s difficult for me to find a specific flaw. That being said, the characters and stories didn’t stay in my mind after reading. Despite the heavy subject matter, the emotional punch to the gut that causes you to close a book of short stories and just take it all in was not to be found. If I loved you, I would tell you this is a solid debut, full of stories of great love living in tension with incredible loss. I only wish there was the additional depth that leaves the reader completely satisfied with just one single perfect story. PS - Happy Valentine's Day, my fellow book lovers! Good morning, ladies and gents! How were your weekends? We were visited by a dusting of snow on Saturday. David has been wishing and wishing for a good snowstorm. Even though this was only an inch or two, we put on snow boots and snow pants and out we went! Reading-wise, I've been alternating between chunks of David Copperfield and a short story or two from If I loved you, I would tell you this. So what are you reading this week? Leave me a comment and let me know! Have a wonderful week! This is a really enjoyable read, especially after my less than stellar experience with my previous book. Ms. Goodman attempts to cover a lot of ground with her novel. Emily is caught up in the tech boom of the 1990s and we get an insider look at how a company grows from start-up to top of the stock exchange. It’s also fun to see Emily and her colleagues discuss ideas for digital products that are a part of our day-to-day lives at this point. Jess becomes close to her boss, George and through her eyes we learn about the intricacies of the market for rare and valuable books. On top of these intensive plot lines, we watch the girls struggle with the death of their mother several years before and experience tragedy on 9/11. I loved the story of Jess and George, as she tries to reconcile her growing love of old books and the man who teaches her about them with her love for the environment and Leon, the charismatic leader of the movement. The relationship between Jess and Emily is excellently rendered. (I can state this with authority because I have three sisters of my own). But there are just too many threads to follow. Goodman introduces too many characters and then sporadically gives the reader a sentence or two to explain what is happening with them. It’s impossible for the reader to connect with all of them. As the book draws to a close, the conclusion seems just a little bit too perfect. This book is often compared to the work of Jane Austen, which I can’t comment on very much because I am still working my way through the cannon. I wonder if Goodman decided to tie up all of the loose ends so nicely in a nod to the happy endings of old. But in a book with a dead mother, crises of both relationships and business, and planes crashing into buildings, I wish that we had been given a more realistic, messy ending. Despite the fact that Goodman tries to pack too much into this novel, the story of Jess and George’s discovery of love through books is wonderful and they are characters that I would love to meet again. The Flame Alphabet follows one family through a post-apocalyptic world, but this one is different from any world you have read about before. In this world, the speech of children is toxic to adults. Their parents became nauseated, weak, and repulsed by the very sound of their children’s laughter and stories. Sam and Claire are parents to Esther, a typical teenager who wants little to do with them. As Esther’s very words make them weaker and weaker, they seek answers in their underground sect of Judaism and perhaps the mysterious man who keeps appearing to Sam. This book got a lot of buzz and I was excited to read it. Unfortunately, it turned out to be one of those books that you are more than content to set down when it is time to do something else. While the premise is interesting, the reader never connects with the characters. Claire and Esther are either not present or incapacitated for large portions of the novel and Sam is aloof from beginning and end. While he goes through this novel presumably in an effort to find safety for his family, we never really feel his attachment to either his wife or daughter. There is a lot I wanted to know that Marcus doesn’t seem to find important to answer for his readers. I wanted to know why the faithful Jews were worshipping in secret, creating huts in the forest where they could listen clandestinely to their leader. I wanted to know how in the world they kept getting all this gasoline for their car in a time of crisis. I wanted to know how life seemed to be going on as usual for so long, despite the knowledge that children are making the adults around them ill with every word they spoke. I wanted to know why children were immune, while adults were keeling over in the street. While Marcus initiates many conversations about the role of language and the relations between parents and children, I couldn’t figure out for the life of me exactly what he was trying to say. While Marcus seems to indicate that language is dangerous, he continues to write and write. Sam is creating a record of his experiences for any future survivors who might be able to survive reading it, despite the obvious trouble with words and language. So is the point that language must endure despite its challenges? I was never sure. Mr. Marcus had a fascinating idea, but his execution leaves much to be desired. Good morning, everyone! How was your week? Did you all enjoy the Super Bowl yesterday? Football has a decidedly soporific effect on me, so I'm more of the "Yay for snacks! Now I will sneak off to a corner with my book" mentality. Hubby started his final semester of graduate school this week, so the end is in sight, thank goodness! What are you reading this week? Tell me in the comments, if you please! I have found that when you read to a little person several times a day, sometimes you will hit a children's book slump. It seems like you have already read everything and you absolutely, will not, under any circumstances, read the book from the Cars movie one more time. When that moment strikes, I like to go back to the classics. Books with chapters that were written long before either one of us was born. We have varied levels of success. David did not appreciate Ramona or that crazy cat Socks. He sometimes will listen to Junie B. Jones, but we abandoned the latest one halfway through. (I know, they are newish, but how cute and funny is Junie B?) 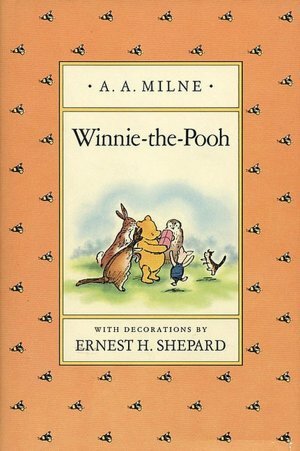 We love the Magic Tree House books, but the books we love best of all are the classic Winnie the Pooh books. My sister gave David Winnie-the-Pooh and The House at Pooh Corner for Christmas. I thought it was time to add them to our collection since we got them from the library every other trip. He really sits and listens to each chapter, usually begging for one or two more stories. I think it's kind of hit and miss which books your child will like, even if they are books that you love. However, I think it's important to give your child a wide variety - easy readers and chapter books, newly published books and ones that you remember from your childhood. I have to imagine that reading longer books helps with attention spans too, which we could really use some work on! 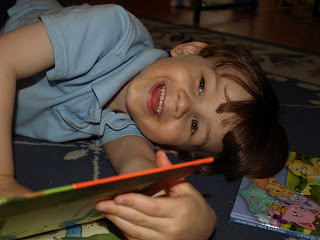 Mama opines: There is something so homey about classic children's literature, isn't there? The knowledge that nothing is going to happen in these pages that will make you wince, the feeling of meeting old friends again, the sneaking of glances at your little one to see how he is reacting - these are the moments when you know that reading to your child is priceless. And aren't the characters in these stories just like small children? Winnie the Pooh with 'little brain,' but very good intentions; Piglet who is scared of almost everything; Eeyore who is grumpy because he never quite gets enough attention; and Owl and Rabbit who attempt to convince the rest that they know more than they do. My favorite moments, though, are the ones when the author breaks into the story. 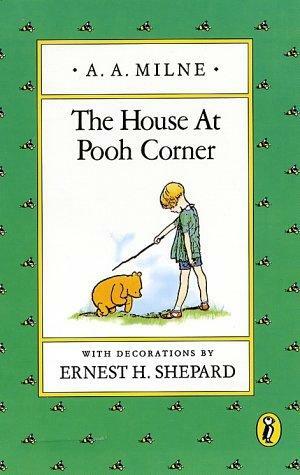 The stories are, of course, inspired by his own son Christopher Robin, his stuffed animals, and the walks that father and son took through the woods near their home. The love that Milne had for his son spills onto every page and begs to be shared with a little one who you love. Thoughts from David: Well, I really really really love the parts that have Winnie the Pooh and my favorite is when they build a house for Eeyore. Who is your favorite? Winnie the Pooh? Tigger? Eeyore? I like all of them! Everyone in the Hundred Acre Woods! See you in the Hundred Acre Woods, friends!